Mahi-Mahi is a prize fish to catch in the fishing world. The goal of most anglers that come to Key West is to catch this beautiful and delicious fish, otherwise known as Dolphin fish. 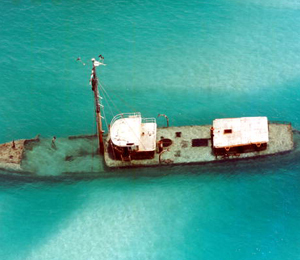 Imagine trolling the open waters off the shores of Key West, and think of how rewarding it would be to catch your dinner. This fish is a favorite among seafood lovers, so if you have the palate for fish in general, this is the one to go for. These fish have a life span of about 5 years, and start reproducing within the first year (somewhere around 4-5 months) of their life at a high rate, so over fishing this species isn’t in sight as of right now. The female Mahi-Mahi will have a rounded forehead whereas the male will have a more squared-off forehead. The female fish is smaller in size than the male fish. The Mahi-Mahi is one of two members of the Coryphaenidae family, the other is the pompano Dolphinfish. This fish, also referred to as a Dorado, is found in the Caribbean Sea, Gulf of Mexico, Atlantic Coast of Florida, Pacific Coast of Central America, and parts of around Asia. Normally found in tropical waters, the Mahi-Mahi tend to stay around off-shore temperate, and have been reported in many parts of the world. These fish are used a lot in the food industry mainly because of it’s large numbers, and it is not any where near being overfished. 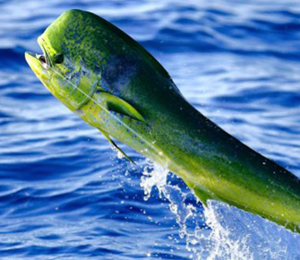 Mahi-Mahi are a carnivorous kind of fish, so they eat fish that are smaller in comparison. This usually means they go after forage fish, crabs, squid, mackerel, flying fish, and also known to eat zooplankton and crustaceans. Juveniles will mostly eat shrimp, fish and crabs found in seaweed. This fish is highly sought after in the sport fishing world, mainly because of their beauty, population, and the food quality. 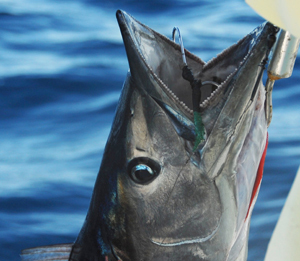 In the French Polynesia, they use harpoons on their boat designed to hunt specifically for Mahi-Mahi. 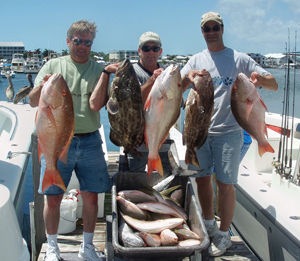 Fishing in Key West for Dolphinfish is usually done on a deep-sea fishing charter or a light tackle charter. For the best result, use a lure that imitate a squid or mackerel fish.